Only four times did I ever visit a farm. The first when I and Mary were 9 and 11 years old. Aunt Norma and Uncle Jim Coulter (not real relations) and their two children, Ken and Valida, had a farm out near Seven Persons. (a small town near Medicine Hat) It was a dried out, mosquito ridden place, and the only redeeming thing was a small creek on the place. I didn't care for it there, and it was the only time in my life I had to eat sour bread. The second time I was grown up and was invited to a country wedding in Saskatchewan. It was fun, but the mosquitoes were terrible. The horses died by the dozen from sleeping sickness caused by the mosquitoes. I've seen horses so covered by them, they were grey from head to tail. I saw one horse lying on its side, banging its head up and down on the barn floor, before they put a bullet through its head. Poor animals, it was a bad year, 1935. In England, the farms are much smaller, more compact, but I like them. My sister and her husband, Ken Tinkler, lived on the farm in County Durham. Linda and Bob saw it when they were tiny, and again since they are grown up. It is a nice farm with a 10 room stone house, 260 years old, on it. The farmhouse in Durham was so ancient it had no refrigerator, and only a wood-burning stove when I was there in 1970. My Uncle Ken's aunt, who owned the place, refused to allow any new-fangled contraptions in HER house, even though my Aunt Mary did all the work. It was not a happy place. 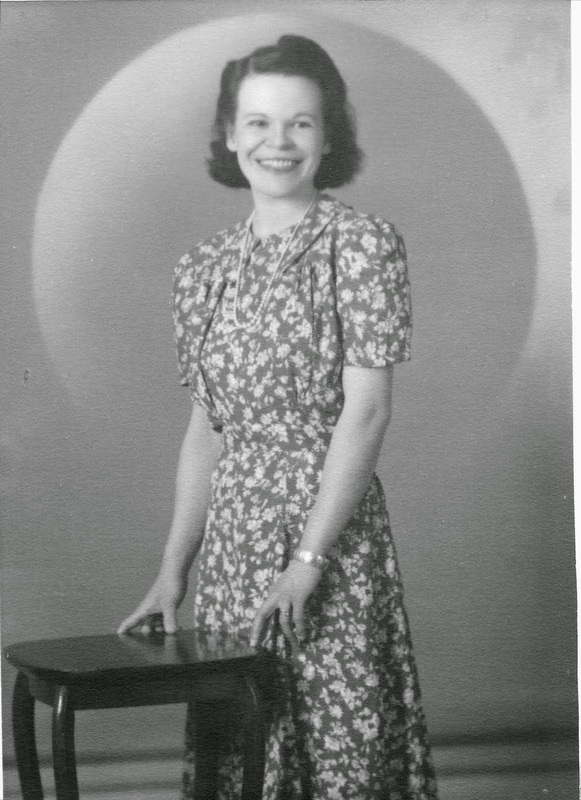 When Jessie Andrews (one of Letty's best friends) retired from the post office in Medicine Hat, she went back to south Manitoba and married her old sweetheart, Jock Armitage. So some years ago we went to visit them. He was 81 and Jessie about 67. They made a great couple and we had such a nice visit with them. We met a 94 year old lady who knew my Grandmother and Mother, and we saw and took snaps of the old house they had at Manitou. It was still in good shape. 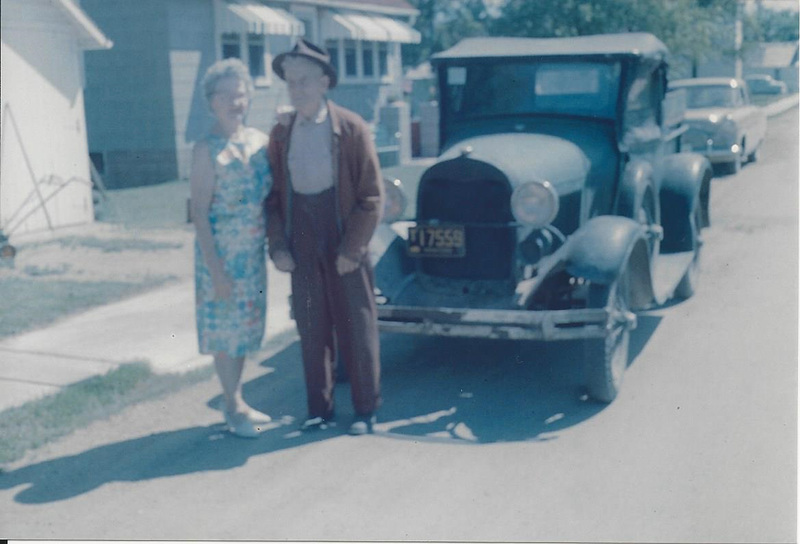 Jock had an old 1929 Model A Ford that he took Dad and Bobby riding in. It was some car. Also on this holiday we met an old lady of 102 years. She showed us some of the forty cushion tops she had made that year. She was so interesting. Since then Jock has died, but Jessie still lives in Altamont. She is near ninety and we still correspond, as she is the one who first introduced Ron and me. So she is special, and always will be. 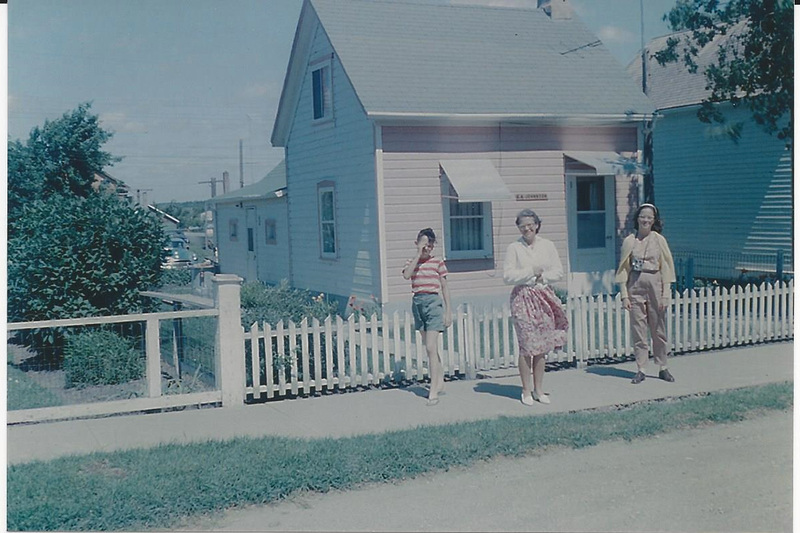 My Great-Grandmother and Grandmother's house in Manitou, Manitoba, 1963. Jessie and Jock Armitage and Jock's old Model A. In the background is my father's first car, a British Ford Zephyr. 1963. Letty's farm experiences ensured that when a farmer once proposed marriage to her, she turned him down. I recall the visit with Jock and Jessie quite well. I was fourteen at the time, a most unattractive age. Bob was twelve; Letty would have been forty-nine. 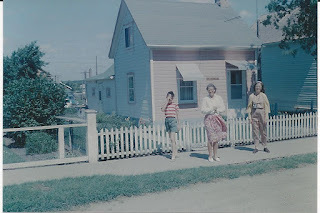 My great-grandmother's old house was in pristine condition in the 1960s. She lived there from 1900 to 1906. I wonder if the house still exists?